Fortunately, the 2016 closure of Tachai island has not affected Koh Tachai pinnacle; the most exciting dive site in Thailand. Some dives make you feel like you are diving in an aquarium. Tachai pinnacle makes you feel like you’re in a National Geographic documentary. Don’t spend too long looking for small things. Look into the blue for Schools of hunting fish, Whale Sharks and Manta Rays! A difficult dive, but real highlight on any Similan Liveaboard. Despite the 2016 closure of Tachai island, the dive site will remain open as usual. Koh Tachai Pinnacle is 400m south of Tachai Island. A collection of deep boulders are home to a huge variety of marine life. Currents can be very strong here. Beautiful coral gardens are overshadowed by magnificent displays of fish. Schools of hungry Barracuda and Trevally keep the fusiliers on constant high alert, creating an awesome sense of action. Koh Tachai is the most exciting dive site in Thailand. Depending on sea conditions and currents, Koh Tachai Pinnacle can be the most challenging dive in the Similan islands, but it can also be the most rewarding. The top of the main pinnacle is between 12-15m. A smaller, but equally beautiful and less visited pinnacle, lies directly North. You can dive 35m or deeper to the South of the main Pinnacle, but usually most of the action is closer to the top of ‘The Dome’. Koh Tachai Pinnacle can be suitable for beginners, but this is not always recommended. Conditions and currents are unpredictable and can change quickly. A relatively experienced Open Water diver, especially one with experience diving in current, would be ok. However, at 18m you have less options to explore. Koh Tachai Pinnacle is generally recommend for Advanced Open Water divers. If Manta Rays or Whale sharks are around, stay near ‘The Dome’. If not, explore the North side of the dive site. The Scuba Diversion ‘Top Tip’ is to head to the North Pinnacle, but you can go even further. A ginormous boulder to the far North West has a stunning coral garden sitting on top. Rarely visited, as it can be difficult to get to, but the payoff is worth it. It is also a beautiful journey past the North Pinnacle to get there. If you only have one dive here, stay on ‘The Dome’. Strong currents here can present the most challenges, but can also be the best dive of a Similan liveaboard. A Sunset dive can be an even more memorable experience. With less light and larger predators frantically rushing to get a last meal before dark, the fish generally seem to be much more excitable and active at this time. Koh Tachai is an excellent day trip, but it is even better as the last dive of the day on a Similan Liveaboard. If waves and strong currents were not enough, let us introduce you to the thermocline known as the ‘Green monster’. Read more about this phenomena on the Similan Diving page. Enormous boulders, huge sea fans, large schools of fish and the potential for ocean giants like Manta rays, Whale sharks and more. There is no question here; bring a wide-angle lens! If you have time to explore, check out the North pinnacle. It is less frequently visited and their are some wonderful soft and hard corals. The Sea fans are more plentiful and the groupers are less shy. You can swim as far North as you like because the reef keeps on going all the way to Tachai island. 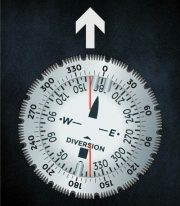 Stay aware of your no decompression time as you will need to spend a lot more time below 18m. Dive on Nitrox if possible. If you are on a Similan Liveaboard you will probably not reach Koh Tachai until day 2 or 3, so you will have time to refresh your diving skills beforehand. If you visit Koh Tachai pinnacle on a day trip, then you would ideally need to have dived fairly recently. This can be a challenging dive. The entry is the most important part of the dive. If you get it right then it will make the rest of the dive much easier. There is one mooring line attached to the top of the main pinnacle. You should be dropped off so the current is pushing you towards the line. Before you jump in take a look at where the buoy line is. After you jump, get your bearings again, then look for the big orange buoy. Buddy up, follow your instructor, and begin to descend. Sometimes it will be possible to descend right onto the top of the pinnacle. Other times you will need to make sure you grab the line as you start to drift past it. Pull yourself down the line until you reach the top of the rocks. Once you are on the dive site then stay close to the boulders and use them as protection against the current. To see a large portion of the dive site it is best to go to your deepest point first and spiral your way back up to the top of the pinnacle. Sometimes the current will be in your favour and other times you will need to swim against it. You can dive to 30m but this is not always the best idea. You will use your air much quicker, run out of no decompression time, and have a much shorter dive. As most of the activity is closer to the top of the pinnacle, it is not necessary to stay deep for a long time. Staying between 15m-25m can make for a longer and more enjoyable dive. The Marine life is very diverse. 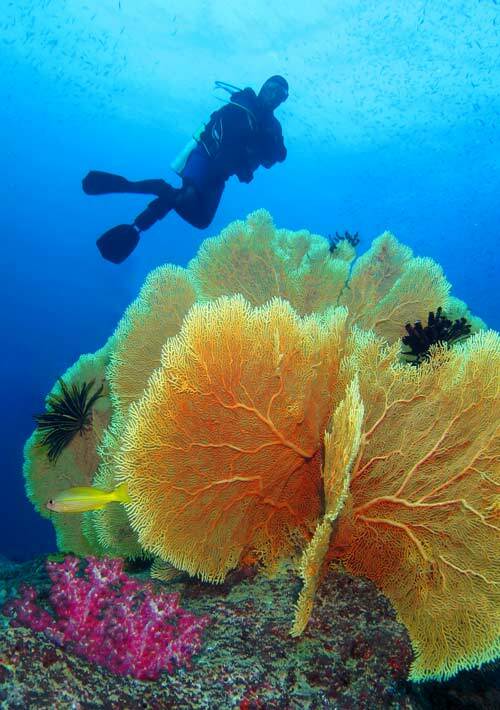 The healthiest corals are the soft corals, particularly the large sea fans. The fish range in size from the tiniest glass fish to Giant Trevally and big marbled groupers. You can find Barracuda, Batfish, fusiliers, rainbow runners, Tuna, Triggerfish, and more. Manta Rays can be seen just as regularly here than at Koh Bon and Whale Sharks could pass by any time of the year. If you insist on looking for small things, you can find nudibranchs and other little critters, but we suggest you turn around and check out what is swimming over your head. Save the macro diving for Richelieu Rock. If you have the chance to do more than one dive here, then there are many areas to explore. The main pinnacle is big enough for a few dives, but you can also go up to the less visited North pinnacle or even the small coral garden on top of the large boulder in the far North West. Richelieu rock may be the most beautiful dive site in Thailand, but Koh Tachai Pinnacle is the most exciting. Use this route at any time the current is not too strong. If you only have one dive here then it is best to stay on the main pinnacle, but if you have the chance, the North pinnacles are definitely worth a look. Start the dive as normal and swim round the main pinnacle. When you reach the furthest North point of the pinnacle the head even further North across the sandy bottom. To get to the second pinnacle, go as far North on the main pinnacle as you can and then follow this heading. You will know you are in the right place when the sandy bottom shallows up to around 20m. Keep swimming across all the large coral heads in the North until you reach a massive boulder on the far North West. shallow up to the coral garden on top of this rock before your safety stop. Before we discuss sharks and rays, we should mention current. Koh Tachai is the most challenging of all the dive sites around the Similan islands. The simple reason for this is that it is prone to strong currents. However, strong currents bring a healthy supply of nutrients with it. Dive sites that receive the strongest currents are often home to the largest marine species. This is why spots like Koh Tachai are such a popular area for Whale sharks, Manta rays and the biggest schools of Barracuda and Trevally. Koh Tachai is a favourite dive site for many casual divers and dive professionals alike. For many, it is even better than Richelieu rock, because of the magnificent displays from large schools of hunting fish. For beginners, it can definitely be a bit of a learning experience, but under the supervision of an experienced guide it should pose no problem. One of the great things about doing a Similan liveaboard is that you probably won’t dive at Koh Tachai until day two or three. This gives you plenty of time to get a bit of practice at dive sites with less current. First of all you can try a few drift dives in places like Anita’s Reef or Breakfast Bend. Work your way up to Elephant head Rock and finally give it a go at Tachai Pinnacle. Strong currents bring a lot of life! Whale Sharks could potentially be seen at any dive site, so make sure you keep checking upwards! The best thing about current is it brings a lot of life with it. Around the similan and Surin islands, Richelieu rock is the most famous dive site for Whale shark sightings. However, based on our personal experience over the last decade, they are just as likely to pass by Koh Tachai. They are also seen cruising past Koh Bon, Elephant Head Rock and the Boonsung Wreck. Unlike Manta rays, Whale Sharks don’t seem to follow the same kind of season. Manta Rays are more frequent from January to April. Whale sharks can appear randomly at any time of the year. Some seasons we have spotted them on the very first trip, other seasons on the last. Some divers spend years, and hundreds of dives, trying to find one. To spot one will always require some luck, but that just makes the experience all the more special. Whale sharks are the largest fish in the ocean. The largest confirmed whale shark was an astonishing 12.65m long and weighed 21.5 metric tonnes! The Whale Sharks that visit the Similan islands are usually juvenile and have a length of around 3-5 metres. When you are face to face with one, 5 metres is big enough! The smallest Whale sharks that come to the Similans can be as small as 2.5 meters. The curiosity of juvenile Whale sharks can actually make for a better diving experience, as they genuinely seem interested in looking at you. Whale Sharks are slow moving, pelagic filter feeders that eat mainly plankton. They travel great distances and are on their way to becoming an endangered species. Spotting one will definitely require a little bit of luck. If you are fortunate enough to encounter one, it is important to act responsibly. Please do not chase, and never touch a Whale shark. There are several ecological reasons for this, but another very important reason is that if you are the diver to scare them away, you will find yourself surrounded by a lot of angry divers. Koh Tachai can be a challenging dive site, but you can often find the rewards worth it. Whale sharks and Manta Rays should never be regarded as a sure thing, but there is so much else to see here. If it really is your dream to dive with a Whale Shark then contact us to find out about their most recent sightings and where they have been spotted. Alternatively, take a look at our Koh Bon page to find out more about diving with Manta Rays.